Diet During Pregnancy: What to Eat, What Not to Eat? It is no news that pregnant women are expected to incorporate a balanced diet regime to provide the growing baby with essential nutrients. 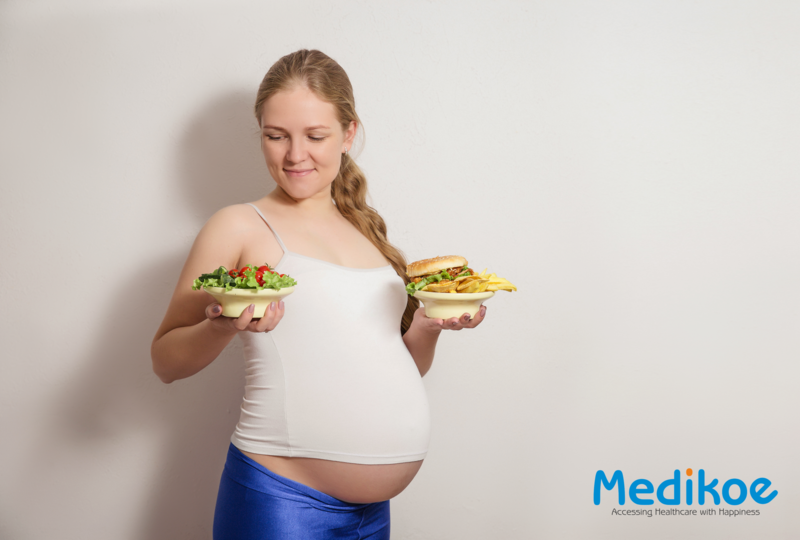 Merely adding calories to your plate is not the ideal pregnancy diet. Approximately, 300 extra calories are required daily to ensure a healthy pregnancy. These calories come from a balanced diet that includes nutrients from various food groups. What to Eat during the Pregnancy? A healthy diet for pregnant women is necessary for Baby’s growth and development. It would be best if you ate from a variety of food groups, including fruits and vegetables, bread and grains, protein sources and dairy products. Here is a list of some of the must-have nutrients to include in your pregnancy diet plan. Folic acid also is known as Vitamin B9 helps in fetal brain and spine development. Folic acid consumption should begin before conception and continue throughout the pregnancy. The U.S. Public Health Service recommends that all women of childbearing age consume 400 micrograms (0.4 mg) of folic acid each day. Most green leafy vegetables, citrus fruits, nuts, and berries contain folic acid. Consuming enough DHA (found in abundance in seafood) is the omega-3 fatty acid that boosts your baby&apos;s brain development. There is a lack of consensus regarding the appropriate levels of fish intake during pregnancy owing to the high mercury content in them. However, consuming fish twice a week is generally considered safe. Your iron needs nearly double during pregnancy, and you need an extra supply to make more hemoglobin. Anemic women are at risk of developing numerous pregnancy complications. An expecting mother needs almost 27 milligrams (mg) of iron per day. Iron can be found in liver, meat, fish, bean curd, wholegrain cereals, green leafy vegetables, and eggs. However, care should be taken towards liver consumption as they contain high levels of Vitamin A. Around 1,000 milligrams of calcium, a day is required for the fetus teeth and bone development in the second and third trimesters. Calcium intake must continue while you are breastfeeding as well. Dairy products are the primary source of calcium apart from leafy greens, cereals, bread, almonds, and sesame seeds. Constipation is a common pregnancy problem. A fiber-rich diet helps prevent constipation and hemorrhoids thus keeping you feeling full and making you less likely to overeat. One must try to get at least 25 to 35 milligrams of fiber a day. Oats, lentil, flaxseeds, fruits, broccoli are some fiber-rich foods. Simultaneously, you need to increase your fluid intake to move the high fiber foods through the digestive system. During pregnancy, blood volume level shoots by up to 1.5 liters, making it important to stay well hydrated. As per general guidelines, it is recommended to drink around 3 liters of water per day. A proper water intake helps relieve constipation, bloating and reduces the risk of urinary tract infections, that are common during pregnancy. Protein helps in fetal cell development and controls blood sugar levels, cutting the risk of gestational diabetes. Red meat, poultry, legumes, soy, tofu, dairy products are some of the sources of protein.